Olympic champion Kat Copeland and partner Imogen Walsh have suffered a shock semi-final defeat at the World Rowing Championships in Amsterdam. The pair only formed a partnership earlier this year, but were favourites for gold in the lightweight double after triumphing in the Aiguebelette and Lucerne World Cups. The Brits struggled in the final 500m, dropping from second to fourth. Meanwhile GB's men's four and women's pair secured places in their finals. Copeland, 23, and Walsh, 30, were in confident mood going to Amsterdam after a positive training camp in Bresiach, Germany. But with 500m of the 2,000m course to go, they were struggling to hang on to second. And when Copeland made an error with the oar, also known as catching a crab, within a few metres of the line, it compounded a miserable day for the duo at the Bosbaan rowing lake. "I'm still trying to digest what happened. I can't really explain it and I'm just utterly disappointed with the outcome," Walsh told BBC Sport. "Perhaps we overestimated ourselves but we definitely didn't perform like we did in training. "Kat caught a crab at the end, but that's not why we came fourth. We were under pressure and that's when things like that happen. Something wasn't right before that." 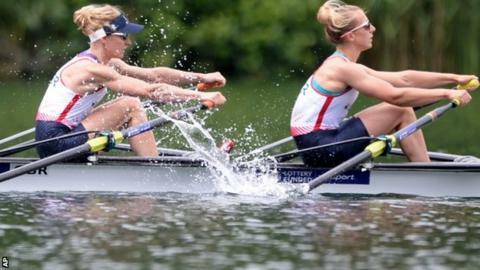 There was better news for Olympic champions Helen Glover, 28, and Heather Stanning, 29, on day five of the eight-day regatta as the pair won their semi-final by seven seconds. Glover is defending the title she won with Polly Swann last year, while Stanning is looking to add the world title to her already impressive medal collection after taking a year out to complete a stint in the Army. Glover said: "That was a good day in the office. We did what we said we would do." The men's four of Alex Gregory, Andy Triggs Hodge, George Nash and Moe Sbihi beat USA by three seconds, easing off in the final part of the race when they knew qualification for the final was secure. "I think we've got at least one more gear to go for the final," Nash told BBC Sport. "We're looking forward to Saturday's race because it's the one we've been planning for all year." Gregory added: "We did what we had to do. We controlled the race and I'm really pleased with our progress through the rounds this week." There was also victory for the men's quad in their semi-final while the women's eight finished second to Romania in the repechage to progress to Sunday's final. The men's pair of James Foad and Matt Langridge qualified for the final after finishing second behind the world leading New Zealand crew of Hamish Bond and Eric Murray, who are now unbeaten in 53 consecutive races. And there was also success for the lightweight pair of Sam Scrimgeour and Jonathan Clegg who won their semi-final to progress. Britain have now qualified eight boats for finals. Read more on Heather Stanning: Back in the boat; on top of the world?